Oconee County citizens get another chance tomorrow night to tell members of the Board of Commissioners what projects they want on the referendum for the 2015 Special Purpose Local Option Sales Tax. Under the revised timeline, the first of two public meetings will begin at 6 p.m. tomorrow in the auditorium of the Civic Center on Hog Mountain Road. A second meeting is scheduled for 6 p.m. on May 12 in Courtroom Number 1 at the courthouse in Watkinsville. The Commissioners are to hold a work session on May 21 to weigh public comments and reach their own consensus on the project list for the referendum. The BOC is then to discuss the list at its regular meeting on May 27 and finalize that list at its meeting on June 3. Voters will get their final chance to pass judgement on the proposed SPLOST projects in the election on Nov. 4, when they will decide if they want to continue the 1 percent special projects sales tax in the county. This is the second set of public meetings on SPLOST 2015 projects, made necessary because a majority of the Commissioners voted on March 4 to postpone the SPLOST vote from the May 20 primary election to the Nov. 4 general election. Commissioners John Daniell and Margaret Hale joined Commissioner Jim Luke in voting for the postponement. Commissioner Mark Saxon voted against the motion to delay. Commission Chairman Melvin Davis, who doesn’t vote except in the case of a tie, spoke in opposition to the action taken by the majority. Daniell and Hale, both up for renomination in the Republican May 20 primary, have been asked about their decision to delay the vote in all three of the candidate forums held in the last two weeks. They have said they did not feel the BOC had enough information on a number of the projects, including plans for fixing a security problem at the courthouse, to go forward with the referendum. Citizens spoke for most forcefully at the two public hearings on the referendum held on Jan. 13 and on Feb. 10 in favor of the requests for funding for the libraries, for parks and recreation projects, and for farmland protection. That was before the BOC had narrowed down the list at a working meeting on March 3. How those discussions–and the politicization of the issues in the candidate forums–will play out tomorrow night and again on April 28 remains to be seen. At that meeting on March 3, Commissioners whittled down the initial requests for $100.3 million to a working list of projects costing $45.8 million. That $45.8 million total is based on a low figure of $1 million for Civic Center renovation. A high figure of $2.5 million also was used. Below is a scorecard listing the requests, the proposal by Chairman Melvin Davis before that March 3 meeting began, and the tentative figure County Clerk Jane Greathouse used in the minutes of that meeting. How–and if–this modified list is presented to citizens at the meeting tomorrow night has not been spelled out in the announcements of the meeting. The tentative list is similar in many ways to SPLOST allocations in the last two referendums. Utility Department and Public Works Department projects dominated SPLOST allocations in the those referendums, as the chart below shows. The Utility Department is in charge of water and sewer services, while Public Works is in charge of county roads. 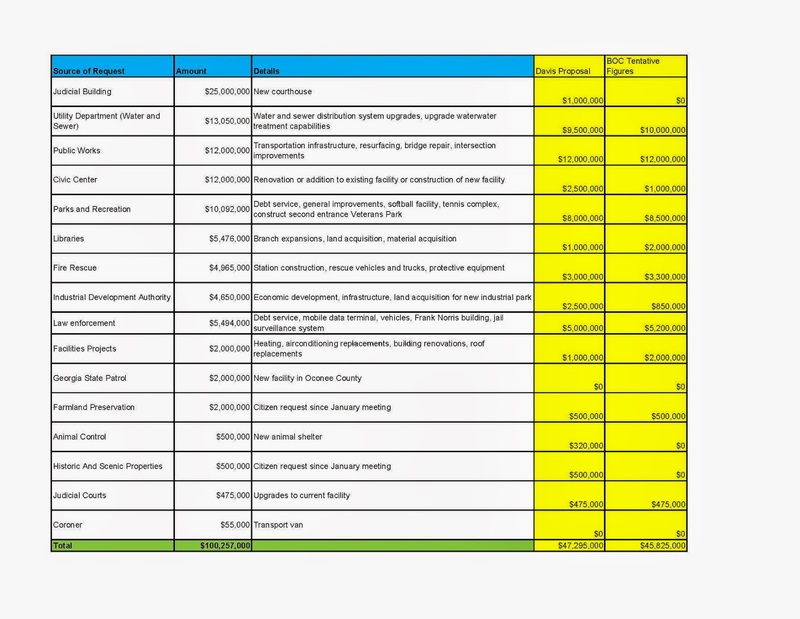 The current SPLOST, which will run until Sept. 30, 2015, also includes nearly $6 million for parks and recreation and just more than that amount for the jail. In the case of the jail, the money goes entirely to debt retirement. In the case of Parks and Recreation, $1.1 million of the total was for park projects, including historic preservation, and the remainder was for debt retirement for Veterans Park. 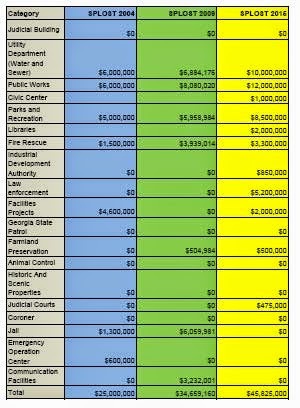 The figures in the chart for 2009 and 2015 do not include funds for the four cities in the county. Decisions on projects in the cities are handled by the cities themselves. The county has a history of giving strong support to SPLOST referendums. Citizens have been asked to approve the 1 percent SPLOST tax seven times, going back to 1985. The lowest level of support was in 1987, when 61.9 percent of the voters decided in favor of the tax. All of those votes have been held in off elections, when turnout is low. In July of 2012, Oconee County voters overwhelmingly went against a new Transportation Special Purpose Local Option Sales Tax. The negative vote was 65.0 percent. That was the first tax initiative voted on locally since the rise of strong anti-tax and anti-government sentiments in the state and country. It is likely that liquor by the drink also will be on the ballot in November. The county has turned down liquor by the drink three times, most recently in 2002. That initiative could drive turnout in November higher, and it could bring out a group of people who are prepared to vote no on whatever is before them, including a new SPLOST tax. Commission John Daniell, who is seeking renomination for the Post 2 position in the Republican Primary on May 20, said at the candidate forum on April 23 that he expects both sides in the liquor-by-the-drink referendum to become very engaged as that election becomes a reality. That forum last week ended on a light note, but one that showed how SPLOST 2015 already has become politicized. Post 3 Commission Candidate Bubber Wilkes used the time allowed him for his closing comments to respond to critical comments made by Robert Wyatt and Ann Stoneburner, 1090 Apalachee Trace. Both were unhappy that the tentative agreement by the BOC on SPLOST priorities cut out funding for tennis courts. Wilkes, in the video below, said a vote for him would be a vote for tennis courts.